Friday November 15th 1895 I ironed this morning and got dinner early. I washed my dishes and Will hitched Relle for me. I drove down alone. I met Hattie on the street so did not go over the river. I was at the Chrysanthemum show and at the Home Mission meeting at Mrs. Dunlaps. I got home in time to do my evening work. read a little. Saturday November 16th 1895 I got through with my baking and morning work nicely. We had dinner by twelve and Will and I went down town in the afternoon. I went over home. Fanny got home last night. Will come for me at four oclock. We did the evening work and went to bed rather early. Sunday November 17th 1895 It was a fine day. We got the morning work done and went down to Aunt Libs by invitation. Eleanor & Ida were there and we had such a pleasant visit. Come home in good time to do chores. I wrote some in the evening after the supper was over. 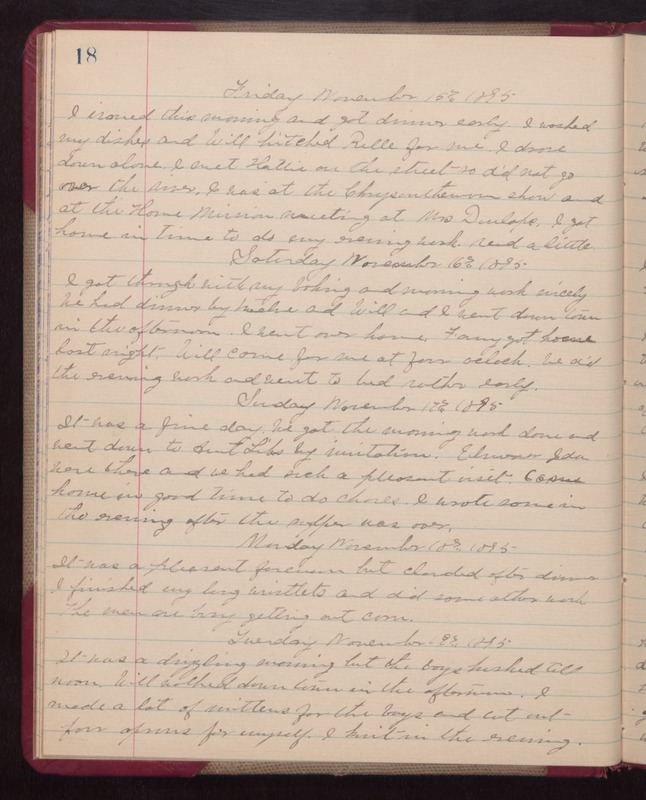 Monday November 18th 1895 It was a pleasant forenoon but clouded after dinner. I finished my long wristlets and did some other work. The men are busy getting out corn. Tuesday November 19th 1895 It was a drizzling morning but the boys husked till noon. Will walked down town in the afternoon. I made a lot of mittens for the boys and cut out four aprons for myself. I knit in the evening.